French: Le déploiement. (2016). Actes Sud. Korean: Unflattening. (2016). Chaek-Se-Sang Pub. Co.
Serbian: Одравњивање. (2016). Center for the Promotion of Science. Portuguese (Brazil): Desaplanar (2017). Veneta. A Life in Comics: The Graphic Adventures of Librarian Karen Green. (Summer 2017). Comic in Columbia Magazine. “How to Draw Comics the Scholarly Way” in The Handbook of Arts-Based Research (2017). Co-authored with Paul Kuttner and Marcus Weaver-Hightower (see details here). “The Fragile Framework.” Climate change comic. (Nov 2015). Co-authored with Richard Monastersky. Nature, 527, p. 427–435. Chapter on Comics-Based Research in The Handbook of Arts-Based Research. (Forthcoming, 2016). Co-authored with P. Kuttner & M. Weaver-Hightower. Guilford Press. “Between Words and Pictures Emerges the Shape of Ideas” (Nov 12, 2015) Digital Writing Month: some reflections on comics as a communication form and introduction to some making exercises including Grids & Gestures. Republished as part of DigPed publishing highlights Nov 23, 2016 here. “Against the Flow.” (Oct 4, 2015). Comic in The Boston Globe Ideas Section. “Grids and Gestures: A Comics Making Exercise.” (2015). SANE journal: Sequential Art Narrative in Education: Vol. 2: Iss. 1, Article 8. “Continuing a Conversation with Maxine Greene in Comics.” (2015). (Co-authored with Daiyu Suzuki). Teachers College Record, Vol. 117 No. 10, p. 1-6. “Upwards.” (May 24, 2015). Comic in The Boston Globe Ideas Section. “Envisioning possibilities: visualising as enquiry in literacy studies.” (Jan 2015). (Co-authored with Anna Smith and Matthew Hall.) Literacy, Vol. 49, Iss. 1, p. 3-11. “Reframing the Discussion — a brief reflection on Genres of Scholarly Knowledge Production.” Jan 22, 2015. Medium.com. Cover for Association of American Colleges and Universities special issue on Diversity & Democracy, Winter 2015. “Threads: A Spinning Fable.” (Dec 2014). Comic in Journal of Curriculum and Pedagogy, Vol. 11, Iss. 2, p. 102-106. “Reconsidering Scholarship through a Dissertation in Comics Form.” (Dec 30, 2014). Media Commons. “Why not? 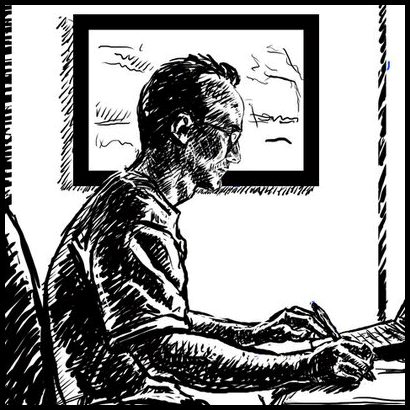 A partial postmortem on creating a dissertation in comics form.” (Nov 11, 2014). Media Commons. “101 Miles of Monument.” (2012). Comic (illustrator, story by Jim Ottaviani) in District Comics: An unconventional history of Washington, D.C. Golden, CO: Fulcrum Publishing. “The Shape of Our Thoughts.” (Summer, 2012). Comics Essay in Visual Arts Research, Vol. 39, No. 1. “New Maps.” (Oct 2011). Comics Essay in Integrative Pathways, Vol. 33, No. 3. “The Importance of Seeing Double.” (Mar 2011). Comics Essay in Integrative Pathways, Vol. 33, No. 1. “Mind the Gaps.” (2011). Comics Essay, chapter in Vinz & Schaafsma On Narrative Inquiry, New York: Teachers College Press. “A different kind of diversity: Collaboration across content areas intensifies learning.” (Oct 2010). (Co-authored with Ryan Goble) The Journal of Staff Development (JSD), Vol. 31, No. 5. “Creativity Reconsidered: Incorporating Care.” (Jul 2011). In International Online Journal of Learning and Teaching in Higher Education, Vol. 3: Proceedings of the 2009 Conference of the European Affective Education Network (EAEN). “Journeys Past; Futures Forged.” (2010). Comics Essay, Speaking Worlds: Oral Histories from…(District 79), Student Press Initiative, Teachers College. “Maxine Says.” (2010, 2008 original). Comics Essay in Dear Maxine: Letters from the Unfinished Conversation, Teachers College Press.